Shark Tale builds on a formula so successfully executed with the Shrek movies. It’s a whiz-bang comedy with fetching animation, but this time too much of the humor will leave children out in the cold. Will guppies in the audience catch the references to The Codfather? This tale is rather cumbersome for what is ultimately supposed to be a children’s movie. Oscar (Will Smith, Men In Black) is a little fish with big dreams. He works at the local whale wash, where his father worked all his life, but he has dreams of movin’ on up to the deluxe apartments at the top of the reef. Unfortunately, all of Oscar’s get-rich-quick schemes wind up being costly, to the tune of 5,000 clams. That’s what he owes his boss, Sykes (Martin Scorsese, Raging Bull), a prickly puffer fish with Mafioso connections. Oscar scrapes up the clams thanks to his best friend, Angie (Renee Zellweger, Jerry Maguire), a beautiful angelfish with a heart of gold and, for whatever her reasons, a big ol’ crush on Oscar. But, true to form, Oscar loses it all in a bet at the seahorse race track, landing him in deep trouble with Sykes. At the same time, there are sharks preying upon the citizens of Oscar’s reef. The mob of sharks is led by Don Lino (Robert De Niro, New York, New York). He’s the father of two great whites: Lenny (Jack Black, School of Rock) and Frankie (Michael Imperioli, Summer of Sam). Unfortunately, Lenny is the black sheep of the family. He’s a closet vegetarian and he has none of the bite of his brother. As fate would have it, the tales of Oscar and Lenny intertwine during a freak boating accident that leaves Frankie dead and Oscar back home telling a great white lie that he’s a shark slayer and hero of all the fishes. With Oscar having achieved the success he so clamored for and Lenny on the lam from his father and masquerading as a dolphin at the whale wash, it’s only a matter of time before the Don and his mob crash the party and put Oscar and Lenny’s unlikely alliance on ice. 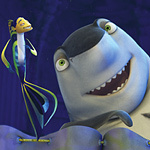 A spoof of gangster movies is fishy source material for an animated children’s movie, but that best sums up Shark Tale. The story works all the Italian Mob angles: the classical music being played over dinner, the moodiness, the aggressiveness, the tone of conversation. Shark Tale is very urban in its sensibilities; Oscar’s reef is a knock-off of Times Square, complete with graffiti and lots of neon billboards. Even the Today Show’s Katie Couric chimes in as Katie Current, the news anchor’s aquatic doppelganger. For an adult, these shenanigans can be highly amusing, but a child will most likely be bored for a good portion of the proceedings. Perhaps this disjointed execution of ambitions can in part be explained away by Shark Tale’s pedigree. One of its directors, Vicky Jenson, co-directed the original Shrek; that’s a very good thing. One of its writers, Michael J. Wilson, co-wrote Ice Age; that’s somewhat acceptable. However, two of Shark Tale’s four scribes, Damian Shannon and Mark Swift, have only Freddy vs. Jason to their scriptwriting credit. That is an eyebrow-raiser at the least. Shark Tale is packed to the gills with pop culture references that, once again, wink at the older audience members at the expense of the little ones who are still too young to watch movies like Car Wash, Jaws, The Godfather, and The Ring. Most guppies in the theater will also not have heard of MC Hammer and Sir Mix-A-Lot, but at least Christina Aguilera provides a spunky new rendition of the Car Wash theme song for the soundtrack. It’s a fantastic cast that is fully taken advantage of for those in the know as to whom the voices belong. The marine characters stunningly take on the likenesses of their voice-sakes. Don Lino bears De Niro’s mole. The lips of Lola, the seductive dragonfish, unmistakably belong to Angelina Jolie (Tomb Raider), and Sykes is the spitting image of Scorsese. The surprise of the pack is Jack Black’s cast-against-type turn as Lenny; Black’s crackpot rock ‘n’ roller attitude, immortalized in his own rock group, Tenacious D, is nowhere to be found in the sweetly genteel shark. With so much talent at its fin-tips, it’s unfortunate Shark Tale is s lot like sushi: it will appeal to those with a certain taste, but most children will squirm.